The official Improve Your Team With Improv page on the OSCON site. There was a great selection of sessions to attend in this time slot so I was deeply torn. The other top contender was Real-time: HTML5 and Node.js however that and the others can be done asynchronously by myself (not as effectively). You can't do Improv by yourself, or at least not in a meaningful way. The session was great. These guys have identified a bunch of Improv exercises and techniques that directly apply to work situations and have cut out all the other Improv activities that would be appropriate for only Improv. Some good techniques on how to get the team to know each other which is especially useful for teams that aren't collocated who need to quickly get to know each other in a short time frame on those rare occasions when they come together. They were also very cognizant of the fact that most people aren't touchy feeling and kept the "touch" exercises that way. At the end of the session they ask us all to write down one item that we thought would make OSCON a better conference. The ideas included swag, free beer, a million dollars for everyone (top voted), free laptops, free conference, and rides on the animals on the covers of the O'Reilly books. People swapped their card and then found partners to divide 7 points between the two cards they had which they then swapped again. The score was written on the back. This was repeated five times and then those five scores added up for a maximum of 35 points. I believe that the winning idea was a million dollars for each person with 31 points. My idea was "A unicorn ride from the hotel to the conference each day. The unicorn would have cup holders and unlimited beer and its horn would be shined each day." This scored in the middle of the range at 21 points. What were those guys on? 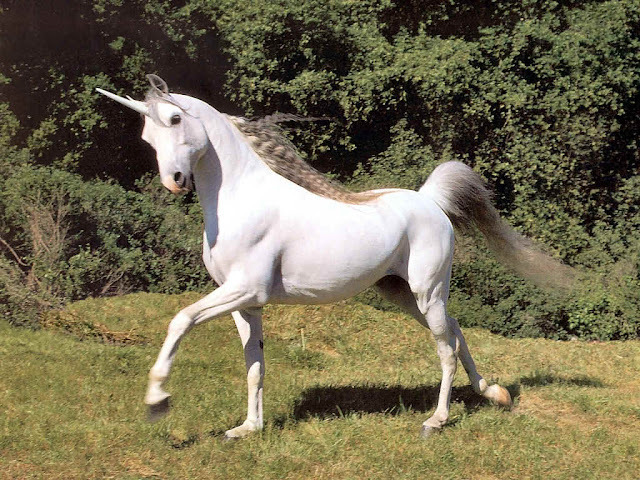 Who would rather have a million dollars when you can ride on a unicorn?